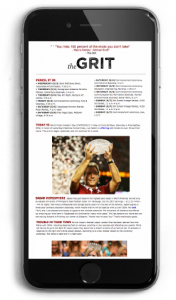 Bama Life, once known as The Grit, is a weekly email newsletter that shares brief and entertaining news with undergraduate students. Local events, trending holidays (because everyone needs to know when it’s #NationalPizzaDay) and fun campus, city and state news bits make up each Wednesday’s issue. If you aren’t already subscribed, sign up to get the nitty-gritty on what’s happening both at home and away..
Bama Life is sent weekly to more than 33,000 undergraduate students.